The revision of China's Constitution is an important task for the annual session of the country's top legislature, and the removal of the presidential term limit is an attempt to safeguard the authority and leadership of the Party, a spokesman for the annual session of the country's top legislature said Sunday. The Constitution has proven a good law that fits China's reality and meets the demand of the times, Zhang Yesui, spokesman for the first annual session of the 13th National People's Congress (NPC), said at a press conference. It can only ensure its lasting vitality by constantly adapting to new situations, he said. The Communist Party of China (CPC) Central Committee in late February proposed changes to the Constitution including removing the expression that the country's president and vice-president "shall serve no more than two consecutive terms." The removal of the two-term restriction is conducive to safeguarding the authority and the centralized and unified leadership of the Communist Party of China Central Committee with Xi Jinping at the core, and to strengthening and improving China's leadership system, Zhang said. Upholding the leadership of the CPC and reflecting the will of the people should be the principles for amending the Constitution, he added. Zhang also stressed at the Sunday press conference that China's defense budget is lower than other major countries. A country's defense budget needs to fit the nation's economic development and national security, Zhang said. China has increased its defense expenditure in recent years mostly to update arms and equipment, improve soldiers' living conditions and the training environment, he noted. 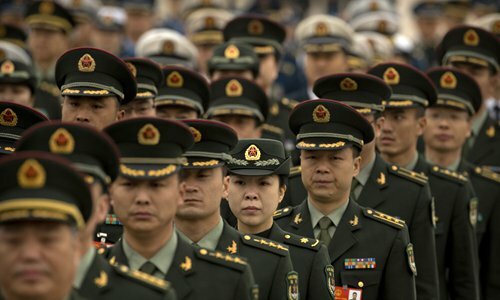 Zhang did not elaborate on how much the defense budget would increase in 2018, while Chinese experts reached by the Global Times said the growth was not likely to hit double digits. Song Zhongping, a Chinese military expert and TV commentator, predicted that the increase was likely to be 8 to 9 percent. The major concern was the increasing price of equipment, such as the J-20 jet fighter, Song said. Even if this year's defense budget increases 10 percent from the previous year, it would only account for 1.6 percent of Gross Domestic Product, much lower than the widely-expected 2 percent. Li Daguang, a professor at the PLA National Defense University in Beijing said the growth was likely to remain at 7 percent, or even lower. The troops have been streamlined, he explained. Even though expenditure on advanced equipment is costly, the total budget was unlikely to surge higher, he believed. China's 2017 defense budget increased 7 percent from 2016 to a total 1.04 trillion yuan ($152 billion). China increased military spending 7.6 percent in 2016, 10.1 percent in 2015, 12.2 percent in 2014 and 10.7 percent in 2013. China will pursue a peaceful development path and defensive strategy, Zhang noted. The country's development will not threaten any other country, he said. As China's development attracts world attention, there are also constant concerns about the country's interactions with foreign countries. When asked whether China was "exporting" its model to change the international order, Zhang said China did not intend to change the world order. China simply wanted a fair and open international order, he said. There is no one-size-fits-all development pattern for the world and China follows its own path, Zhang said. China would not import a foreign model or export the Chinese model, he noted.